On October 11, 1812, Major General Isaac Brock writes to Sir George Prevost and to Colonel Porter about the American attacks on the British brigs Detroit and Caledonia. Brock is worried that the Americans were trying to gain supremacy of the Great Lakes. In fact, the American Commander at Lewiston, General Van Rensselaer, had planned to launch an attack across the Niagara on October 11 at 3 in the morning. Bad weather, and the fact that an American Officer, Lieutenant Sim, took most of the oars for the boats and then deserted, meant that the attack had to be cancelled. A new attack is set for October 13. Brock's letters are reproduced below. Sir Isaac Brock to Sir George Prevost. 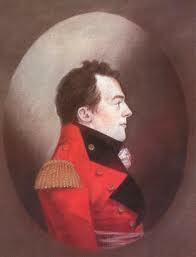 I had scarcely closed my dispatch to your excellency, of the 9th, when I was suddenly called away to Fort Erie, in consequence of a bold, and, I regret to say, successful attack by the enemy on his majesty's brig Detroit, and the private brig Caledonia, which had both arrived the preceding day from Amherstburg. It appears by every account I have been able to collect, that a little before day a number of boats full of men, dropped down with the current unobserved, boarded both vessels at the same moment, and, cutting their cables, were proceeding with them to the American shore, when Major Ormsby, who witnessed the transaction, directed the batteries to open upon them, and soon compelled the enemy^te abandon the Detroit, which grounded aJjowTfne centre of Squaw Island, a little rHoja^ftSna mile below Black Rock. She was then boarded by a party of the 49th regiment; but as no anchor remained, and being otherwise unprovided with every means by which she could be hauled off, the officer, throwing her guns overboard, after sustaining a smart fire of musketry, decided to quit her. A private, who is accused of getting drunk, and a prisoner of war, who was unable from his wounds to escape, with about twenty prisoners brought by the Detroit from Amherstburg, remained however behind ; these it became necessary to remove before the vessel could be destroyed, and Cornet Pell Major, of the provincial cavalry, offered his services. Being unfortunately wounded as he was getting on board, and falling back into the boat, a confusion arose, during which the boat drifted from the vessel, leaving on board two of the 41st, who had previously ascended. In the mean time the Caledonia was secured by the enemy, and a cargo of furs, belonging to the SouthWest Company, landed. The batteries on both sides were warmly engaged the whole of the day, but I am happy to say no mischief was sustained by the enemy's fire. I reached the spot soon after sun-set, and intended to have renewed the attempt to recover the Detroit, which I had every prospect of accomplishing, assisted by the crew of the Lady Prevost, which vessel had anchored a short time before; but before the necessary arrangements could be made, the enemy boarded her, and in a few minutes she was seen in flames. This event is particularly unfortunate, and may reduce us to incalculable distress. The enemy is making every exertion to gain a naval superiority on both lakes, which if they accomplish I do not see how we can retain the country. More vessels are fitting out for war on the other side of Squaw Island, which I should have attempted to destroy but for your excellency's repeated instructions to forbear. Now such a force is collected for their protection as will render every operation against them very hazardous. The manner our guns were served yesterday, points out the necessity of an increase, if possible, of artillerymen to our present small number of regulars. The militia evinced a good spirit, but fired without much effect. The enemy, however, must have lost some men; and it is only wonderful that, in a contest of a whole day, no life was lost on our side. The fire of the enemy was incessant, but badly directed, till the close of the day, when it began to improve. Lieutenant Rolette, who commanded the Detroit, had, and I believe deservedly, the character of a brave, attentive officer. His vessel must, however, have been surprised—an easy operation where she lay at anchor ; and I have reason to suspect that this consideration was not sufficiently attended to by the officers commanding on board and on shore. We have not only sustained a heavy loss in the vessel, but likewise in the cargo, which consisted of four 12-pounders, a large quantity of shot, and about 200 muskets, all of which were intended for Kingston and Prescott. The only consolation remaining is, that she escaped the enemy, whose conduct, after his first essay, did not entitle him to so rich a prize. The enemy has brought some boats over land from Schlosher to the Niagara river, and made an attempt last night to carry off the guard over the store at Queenstown. I shall refrain as long as possible, under your excellency's positive injunctions, from every hostile act, although sensible that each day's delay gives him an advantage. Sir Isaac Brock to Colonel Proctor, at Detroit. The unfortunate disaster which has befallen the Detroit and Caledonia will reduce us to great distress. They were boarded whilst at anchor at Fort Erie and carried off: you will learn the particulars from others. A quantity of flour and a little pork were ready to be shipped for Amherstburg ; but as I send you the flank companies of the Newfoundland, no part of the provisions can go this trip in the Lady Prevost. It will be necessary to direct her to return with all possible speed, bringing the Mary under her convoy. You will husband your pork, for I am sorry to say there is but little in the country. An active, interesting scene is going to commence with you. I am perfectly at ease as to the result, provided we can manage the Indians and keep them attached to your cause, which in fact is theirs. The fate of the province is in your hands. Judging by every appearance, we are not to remain long idle in this quarter. Were it not for the positive injunctions of the commander of the forces, I should have acted with greater decision. This forbearance may be productive of ultimate good, but I doubt its policy—but perhaps we have not the means of judging correctly. You will of course adopt a very different line of conduct. The enemy must be kept in a state of constant ferment. If the Indians act as they did under Tecumseh, who probably might be induced to return to Amherstburg, that army will very soon dwindle to nothing. Your artillery must be more numerous and effective than any the enemy can bring, and your store of ammunition will enable you to harass him continually, without leaving much to chance. I trust you will have destroyed every barrack and public building, and removed the pickets and other defences around the fort at Detroit. You will have the goodness to state the expedients you possess to enable us to replace, as far as possible, the heavy loss we have sustained in the Detroit. Should I hear of reinforcements coming up, you may rely upon receiving your due proportion. Nothing new at Montreal on the 25th ult. Lord Wellington has totally defeated Marmont, near Salamanca. * I consider the game nearly up in Spain. May every possible success attend you.